I grew up with a mother who had trouble walking. She was born with a rare Muscular Dystrophy Disease called “Charcot Marie Toothe”(CMT). As a result, she had slightly deformed legs, club feet and poor muscle strength in her legs. She was born in 1928, and back then they did not know what caused her problems. She did recount memories from childhood of specialists throwing around the name “Charcot Marie Toothe” at the Mayo Clinic, but she only received a proper diagnosis later in life. My mother underwent multiple surgeries on her legs that probably did more harm than good. I have no childhood memories of running with my mother, or walking very far. I remember as a teenager, there being a discussion over whether she could walk about a mile to our synagogue for the Jewish High Holidays. My father did all the laundry until we were old enough to help because she could not walk down a flight of steps to the basement. Despite her condition, overall, life was normal. My mom was limited but still functional. But then I hit my early twenties and her walking got progressively worse that she could no longer walk without holding on to something; a wall, a piece of furniture, or someone’s arm. And yet, she didn’t complain. As an adult, I think back and ask myself how could she not? We didn’t really dwell on her challenges because she just bore them. By the time she was 60 years old, she could not walk independently at all. That was around the same time that my father passed away, so she no longer had his assistance – or companionship – making things even more challenging for her. My mother finally came to the realization that she needed to address her mobility problem, so she went to physicians, therapists and an orthotist who all specialized in walking. This intervention should have addressed the problem. She sought the assistance of all the right people. Yet after ten weeks of therapy, thousands of dollars in leg braces, and a standard walker, she was not doing well. She made peace with wearing leg braces but, to add insult to injury, they were too cumbersome to use. I have a clear memory of the time I was home and she was struggling with all her hardware and finally seeing her breakdown in complete frustration. It surprised me; my mom was a fighter who had persevered through so many challenges. When I saw her defeated like that, even if momentarily, I knew right then and there that she – we – had a problem. I started to pay more attention, and I got more involved. I realized that my mom needed my help to get her back to walking. I accessed the situation… and I didn’t have to be a doctor or physical therapist to realize that her walker was not stable enough to properly help her. So I went out looking for a better walker and we tried a few with wheels but, she could not control them. I could not believe there was not a single walker on the market that could meet her needs. I started to wonder if I could design a suitable walker for her. I had never done anything like this, but, having grown up with an engineer father, I was not afraid to try it. I liked spending time with my father when he would fix things or, even better, when he would devise something for the house. It always started with an accurate to-scale drawing on graph paper. No scribble allowed! I also learned to draft designs in high school woodshop class. Who knew this skill would come in so handy in real life? I was determined to find a way to make a walker stabile enough. As stable as holding onto a wall or someone’s arm. I visualized a stable base that surrounded my mom – and that is where the U-shaped base came from. It surrounds you – and braces you in every direction. U-shaped base that surrounds the user, increasing support and stability. After some initial drawings that would not have passed my father’s exacting standards, I set off to Builders‘ Square to buy materials for the project, including cables, furniture casters, lawn mower wheels, water pipes and fittings, and other odd items to try to concoct an original walker for my mom. A few days later, I started to fashion the first “U-Step” in my mom’s basement. I did not have the tools or skills for working with metal so I stuck to wood for everything but the water pipe handlebars. I worked with power saws, drills, and sanders to fashion the U-shaped base. It sure wasn’t pretty but, I was on my way to having a working prototype. I remember bringing it upstairs for my mom to try it. She grabbed onto the handlebars and stood up and started to walk! I asked her what she thought and she said that it was good. Really?! So I was encouraged to continue. I then jerry-rigged a braking system with the help of a cousin, Alan Woodhouse (a tool-and-die expert), who generously gave of his time to get this project done. So my mom started using this primitive walker around the house and it did the job. Being able to place some weight on the handlebars was enough to keep her knee from buckling, so she did not need the leg braces and she was walking with just the help of this walker. Amazing! The story could have ended there. Not long afterward, my mother was using this walker at her internist’s office. Dr. Weiss took a long look at the product and how my mom did with it and said: “this could help a lot of people.” He reached out to me and encouraged me to produce this walker for others. I considered his suggestion. I had always wanted to go into business. That is what I studied in college and I was working in new product marketing research and consulting for a firm in downtown Chicago. I started the process of turning “Pauline Miller’s Walker” into a business. I started to do some market research, business planning, and redesigning the “U-Step” for production. A $2,000 cost per unit wasn’t going to fly in the market. Years later I ran into Dr. Weiss – who also coined the name “U-Step” – and I thanked him for his initial encouragement. He told me that he had second-guessed himself and thought – what if he was wrong and I spent my energy on this project and it failed? He was relieved to learn that his first instinct had been right! It took about a year, but I used the money I had saved since graduating college and completed my first production run of ten units. Progress. Those ten only cost $600 a piece…. and I was able to sell them for $395! I sold at a loss because I knew I had to prove the concept before I could start making money. Depleting my funds, I managed to obtain an SBA loan for $60,000 to pay for a production run of 50 units, which took me a full year to sell and break even. No salary for me at that point. With no money left to go on, I started to get creative about funding; I put about $40,000 on personal credit cards (over which I am still waiting for my wife’s forgiveness), and I was still working out of our apartment. My big break came when a very satisfied U-Step customer asked me about the business. Her husband (a successful businessman), and his investment group put in enough of an initial investment to really get the ball rolling. It was time to find a manufacturer able to produce our product at a much lower cost, so I could finally start making a living. Although I had managed to secure some initial funding, I had another big hurdle: I had a brand new product but did not know exactly who my customers would be, or how to reach them. My first instinct was to meet with physical therapists to educate them on the product and have them prescribe it. As I did, I heard from many therapists that they all thought the U-Step would be great for their Parkinson’s patients. That, combined with an article in a Parkinson’s newsletter, jump-started sales to the Parkinson’s community. I had two top Parkinson’s centers request brochures for their patients. Almost immediately, these offices started to prescribe our product many times a week. I figured if I could sign up more neurology offices to recommend the product, I was on to something. And that worked! I ended up traveling around the United States meeting with major neurological centers and slowly but surely the business grew. 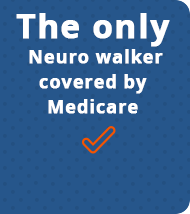 We became a Medicare provider and we sold mostly directly to patients. We are now finally in a position to be able to help people all across North America (and some internationally) in improving their quality of life, reduce hospital stays, increase mobility and function, and reduce falls and the many tragedies that ensue from them. We are launching new U-Step models with increased specificity to meet various needs depending on conditions, and various accessories to further customize each walker for each customer. My mother used her U-Step for over ten years before passing away. It kept her up and walking and in her own home, which is what she wanted. 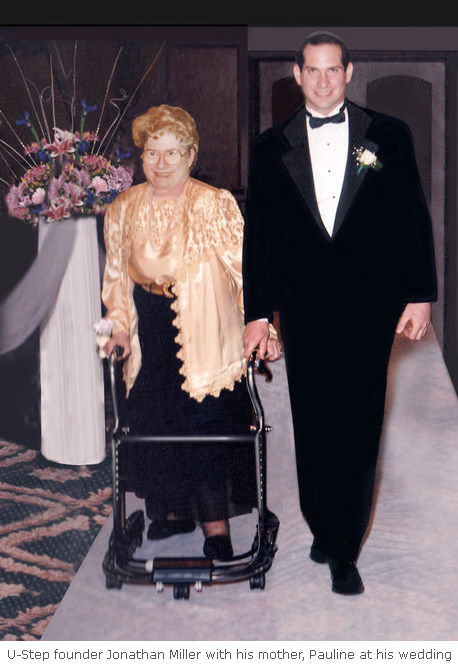 Every time I receive an email from a physical therapist, U-Step user, or a customer’s caregiver about how our walker has changed someone’s life, I think back to my mother and think that in her merit, so many people have been helped. I tell all of my employees to treat our customers like they would treat their own mom. It is also why I never stop at “good is good enough” with our design. The U-Step has been through many redesigns to make the product the best possible. Every product I make has the same level of care and devotion as I had when making the first unit for my mother. When I initially decided to study business I could never have imagined that through the pain and struggle of trying to help my mother when there was no help to be found, I would “stumble” upon a business that would give me such a sense of purpose and satisfaction. I feel blessed to work in a field that I am passionate about and that I can help people avoid falls and stay independent.